I hate to confess that I'm not a super crafty person, although I wish I was and pin DIYs onto my boards like I am. I can make most things but they never look like the coveted picture and I end up getting annoyed. It's annoying to constantly produce things that are just okay. So, when I saw today's #blogmas14 prompt was to write about a DIY Christmas ornament I was so happy that I have one I've already made this year and actually like! I could have just posted about some of the other 27 DIY ornaments I've pinned but I wanted to talk about something I actually attempted at making. This was an ornament I knew I wanted to make this year for a few different family members and a close friend. 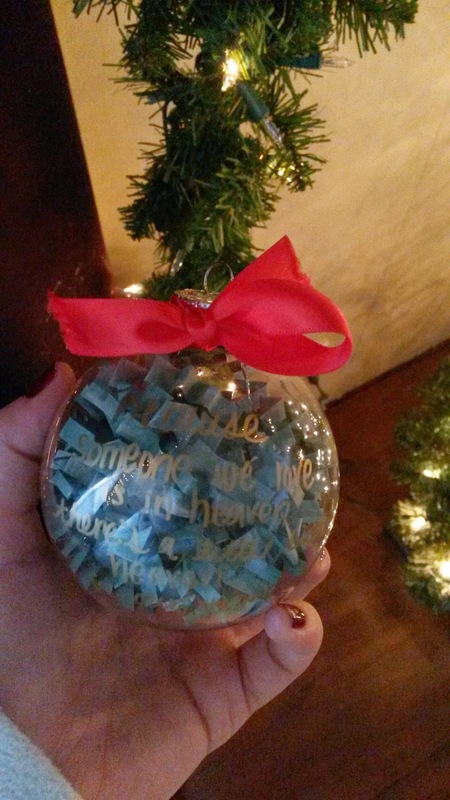 I shockingly didn't base it off an idea I saw on Pinterest but instead on an ornament I purchased last year from Etsy for my boyfriend's sister-in-law that said: "because someone we love is in heaven, there is a little bit of heaven in our home". I'm always on a budget when it comes to Christmas shopping and this year was no different once I realized just how many times I had swiped my credit card this season and had to start cutting back. I bought a package of four, clear glass ornaments from Target and got started! All of what I used can obviously be customized to whatever you like! 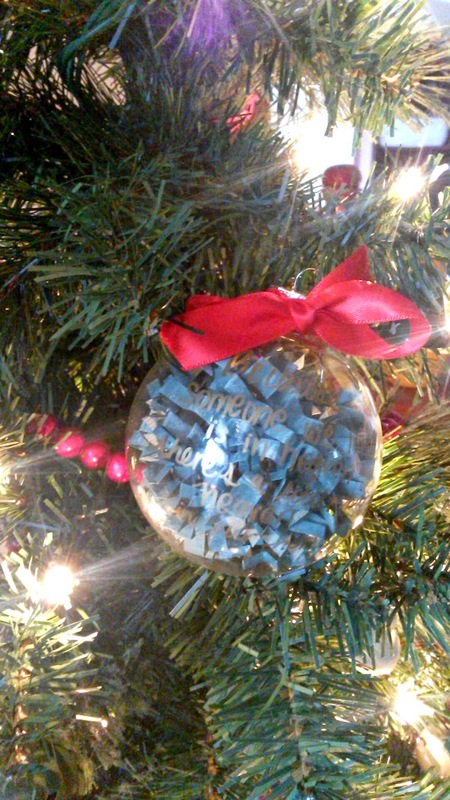 I wanted to use clear ornaments because I had a gold sharpie I had recently purchased (on sale for $.75!) and have become obsessed with and wasn't sure how it would appear on other surfaces (in retrospect..it probably would have looked better on a solid color background...see! a sucky crafter!). I could have gone and purchased some colored crinkle paper which I used to fill the ornament with but since I'm lazy and cheap (a great combo for a crafter..) and wanted to make them that night I took some random plain paper we had at home, colored it green with one of my sketching markers, cut them into little thin strips and crinkled them myself. I used red satin ribbon I had gotten at the dollar store and tied it around the top of the ornament to add a pop of color. It's hard to read in the pictures... okay, it's a bit harder to read in person too... whoops. It's the thought that counts, right? The original ornament I purchased cost me about $16 and I made four of these for a total of $7.75+tax which is a win in my book. I was happy with how these came out based on my past crafting experience so I gave my mom's hers early because I wanted her to put it on the tree and she teared up when I gave it to her. I'm giving one to my mom and grandma because we lost my grandpa this year, my boyfriend's mother and one of my best friends who both lost significant people in their lives this year. It was unfortunate how many people I could give these to this Christmas but I hope they like putting these on their future trees to make the holidays, which are always so hard without our loved ones, a little easier. Thanks to Tay & Ash for hosting! Looking forward to seeing what ornaments you've all made or would like to make. 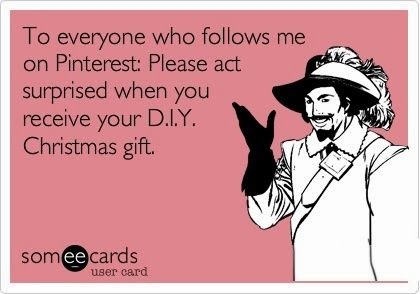 Here's hoping you're all far more crafty than I ;) Happy Sunday, loves. Such a cute idea! It's amazing how many different things you can do with plain glass ornaments. I'd try this out but my handwriting is nowhere near as nice as yours lol! Isn't it though?! Thank God you can find clear glass ones for cheap! & thank you! This is such a cute idea!! I love the way your ornament turned out! !